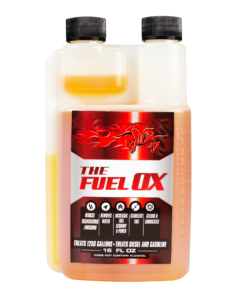 The Fuel Ox™ is dedicated to providing fuel consumers the most technologically advanced fuel treatments on the market. Our advanced formulas were originally developed for extraordinarily high intensity applications. Over time, our fuel treatments were modified for commercial applications. Remove water, aphaltenes, and other contaminants. We service a wide range of industries around the world including automotive, shipping, aviation, railroad, busing, trucking, mining, construction and home heating. A multifunctional and performance enhancing additive that contains lubricity agents, detergents, as well as a patented catalyst that improves overall vehicle performance. A multifunctional and performance enhancing marine additive. The product’s ability to increase lubricity and power while protecting against sludge and ethanol make Fuel Ox Marine stand out from other marine additives. A multifunctional and comprehensive fuel treatment that enhances fuel combustion and engine performance. It removes and prevents the formations of asphaltenes found in of today’s heavy duty engines that employ a high pressure fuel injector system. Twin Cummins diesel engines are running smoother than ever. -Rory Greenley, Fuel Manager / Ace Robbins, Inc.
A complete over-the-road winter fuel treatment and combustion catalyst with military grade anti-gel. This product protects against fuel gelling by lowering pour point by 33°. The Fuel Ox Heating Oil Additives Line offers a heating oil additives line that is designed to reduce fuel related service calls and increase customer satisfaction with heating oil. A multipurpose additive for all year round that protects and improves overall efficiency of vehicles and engines. These products are specifically designed for bulk use in gas stations and fuel terminals. Fuel Ox also provides a Winter RACK additive. HEATING OIL ISSUES RESOLVED THANKS TO FUEL OX AND AL!!! Treatment made easy, not worried about my fuel at all.